All events are FREE and OPEN TO ALL. Bookings are requested for all events. Berkhamsted Place was built by Sir Edward Carey in the reign of Queen Elizabeth I, using material from the Castle. From the 18th century onward it was frequently referred to as the Castle. Although little remains of the mansion itself the area is rich in history. The Great Barn is probably older than the house. The Inns of Court Officers’ Training Corps was stationed in Berkhamsted from 1914-1919 and thanks to the valuable legacy of photographs by James Thomas Newman we are able to recapture something of the life in the town at that time for soldiers and locals alike. Meet on Bank Mill bridge. A myriad of events and activities RIP. Come and see the transformation that has taken place. find your ancestors in this haven of tranquility. The Hospital moved to the new purpose-built building in 1935, on the outskirts of Berkhamsted. Former foundlings will conduct tours and tell you of life in the Hospital which became more isolated during WWII when visits from foster parents, and summer camps were discontinued. Wear stout shoes and bring a torch for visits to the crypt, and see the stained glass windows brought from the London Foundling Hospital. Meet at bottom of steps leading up to Old Hall. 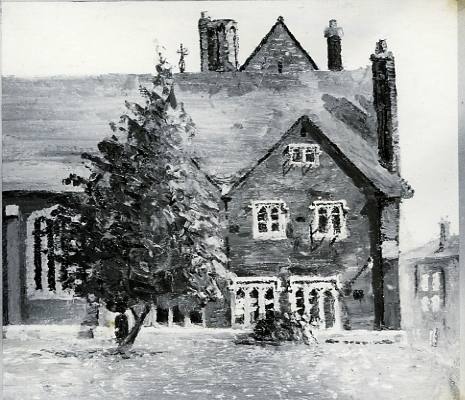 Old Hall, the original School House, built in 1544, was the largest school building at the time exceeding Winchester and Eton in size. The beautiful little chapel is Victorian and was largely financed by Dr Fry who became Dean of Lincoln, and his wife. It was built by the local architect Charles Henry Rew, but based on the little chapel of Santa Maria dei Miracoli in Venice. This Victorian Town Hall, by the architect Edward Buckton Lamb, was opened in 1860 to replace the Market House destroyed by fire in 1854. It included a large meeting hall and a room for the Mechanics’ Institute in addition to the Market Hall. There is a permanent exhibition of old photographs relating to the Market House and Town Hall. This royal castle, the finest example of a Norman motte and bailey castle extant, still belongs to the Duchy of Cornwall. It has a long history with many royal associations, although not inhabited since 1495. Exhibition in Visitors’ Room, depicting history of castle. We have no Victorian pillar boxes in Berkhamsted. The oldest surviving box in the town is in Gravel Path, a well-preserved pillar box outside the old sub Post Office which now a residential property aptly named “The Old Post Office”. This converted fire station is an accredited museum although not a museum in the normal sense. It houses collections from different societies and other bodies from all over Dacorum, including those belonging to BLH&MS and BDAS.